Set your sails and calibrate your compass! It's time to take artisan-edition vessels and castles out for a spin! The Rudders & Ramparts expansion features artisan-edition vessels and castles that may be used purely for decoration - or to play a military variant of the game Feudum! 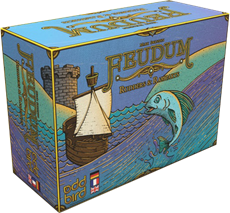 Upon acquiring a regular vessel or feudum, players may pay an additional shilling to upgrade to a deluxe vessel or castle feudum. Players earn +1 attack for a deluxe vessel and +1 defense for a castle feudum. At the dawn of each epoch, players must pay 1 shilling to maintain each castle or deluxe vessel in their possession - or lose their advantage! You still have a few days to support game on Kickstarter!